1. Cook Burger to order (we recommend cooking to medium rare for a juicier, more flavorful Burger). 2. Add slice of Monterey Jack Cheese to Burger just before it finishes cooking and let melt. 3. 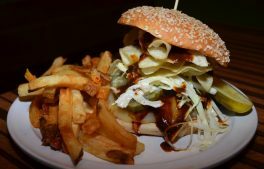 Place Burger on Sesame Seed Bun and top with Cole Slaw, Pickles, and BBQ Sauce. 4. Add Potato Chips for a satisfying crunch. 5. 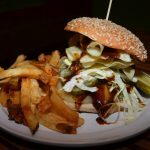 Serve with a pickle and a handful of fresh cut fries, and enjoy!